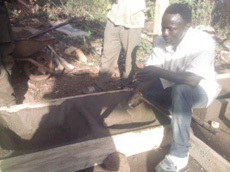 Main Criteria for the Selection of Beneficiaries? 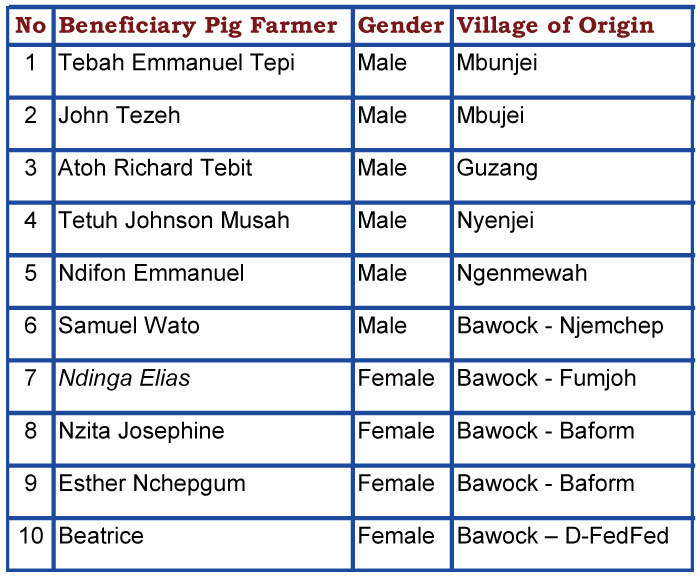 You must belong to a group that is a registered member of the pig cooperative (NOWEPIFAC) and should have pigs currently. You must have contributed your 2000 FRS CFA annual dues for 2015 as agreed by the cooperative general assembly meeting of group delegates. 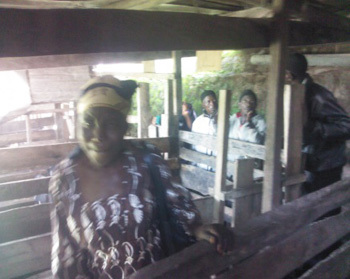 You should have attended training on pig farming organized by NOWEPIFAC. 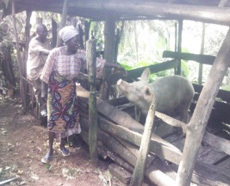 You must have not benefited earlier on from any of the support projects of the pig cooperative especially the Yaounde Dutch Embassy sponsored "SOS piglet multiplication project" which included infrastructure. (This statement is applicable only to members of groups in Bawock village). 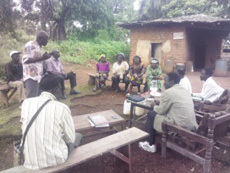 Beneficiary Planning meeting at NOWEPIFAC Head-Office in Bamenda took place on the 14th October 2015. On this day all the selected beneficiaries from Guzang, Mbunjei, Nyenjei, Ngenmewah and Bawock were informed about how much is the total donation from Djouke Elferink, from the Netherlands and how much is expected from Go Komatsu for the "SOS Japan support". In this meeting it was reaffirmed as agreed during the selection meeting that beneficiaries have to provide their own support for the realization of the project since the number of beneficiaries have increased to 10. 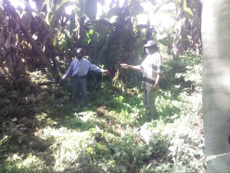 Site preparation and the mobilization of working material from site of deposition to fence construction site. They will assist financially in fueling the engine saw and motivate the saw operator that will saw the wood to be used for construction and transport it to the site. 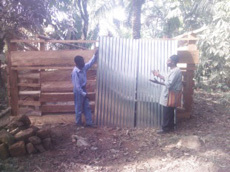 5000 FRS each will be provide from the Project fund to assist beneficiaries in the sawing of the wood. 4. 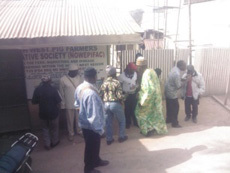 )Reception of fences by NOWEPIFAC project officials and handing over for use to the beneficiaries with a code of conduct/guideline for effective usage. 5.) Preparation and submission of detailed activity and financial Report to sponsors by the project execution team. NB:- In every home man and his wife share assets, so gender is not so important. 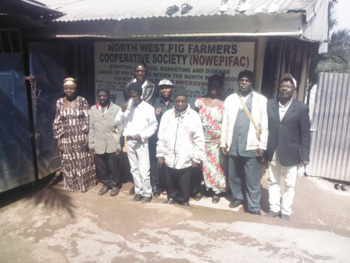 After the meeting members present took a group photo in front of the cooperative office and then went to visit the piggery of the project coordinator. 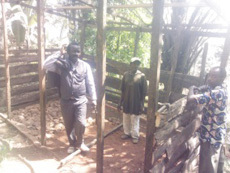 Meeting with the Nyenjei group, visit to piggery of beneficiary- Tetuh Johnson, he showed us the site. Meeting with the Guzang Group(Project coordinator, Personally did the measurements and gave instructions on how to prepare the construction site. 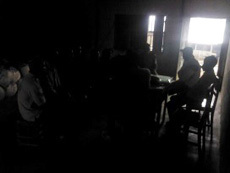 Meeting with the Ngenmewah group in a dark room without sufficient lighting. Measured the site. Wato Samuel,　Ndinga Elias, Beatrice, and Nzita Josephine. 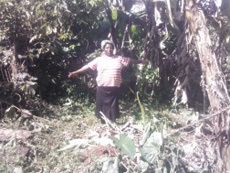 In Bawock one beneficiary was absent during the site selection visit (Esther Chepgum) but her site was made known. Left/Second from left : Refreshment after meeting(in Bawock). 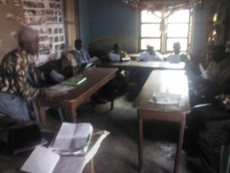 Right/Second from right : Prayers Before meeting discussions start (in Bamenda). 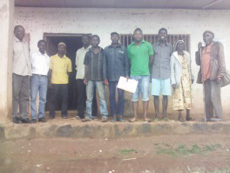 Mid term report of project and project evaluation meeting by group delegates in Bamenda. 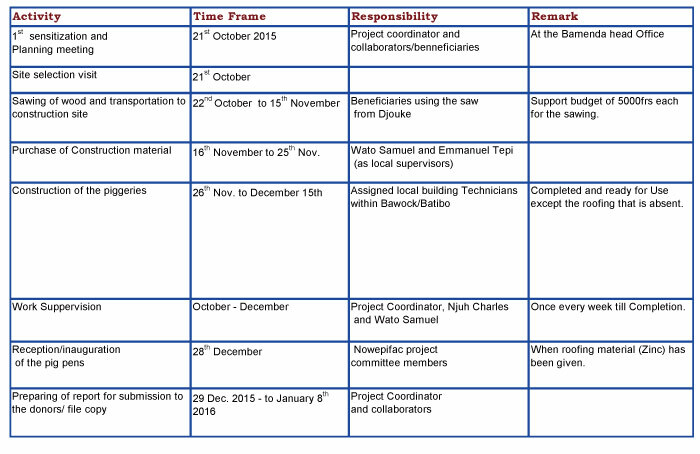 The meeting of Wednesday 2nd December 2015 was held in Bamenda respecting the normal scheduled timing of 2015 NOWEPIFAC delegates' meeting calendar. 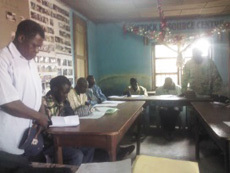 During this meeting a detailed report on the level of realization of the 10 piggeries under construction was given by Wato Samuel (for the Bawock 5 pig pens) and Emmanuel Tepi (for the Batibo 5 pig pens) because they were the people responsible for the purchases of the required material for use and work supervision in the two different communities under the direct instructions and guidance of the project coordinator. They explained their difficulties on the field and received instruction on what to do with respect to those constrains. 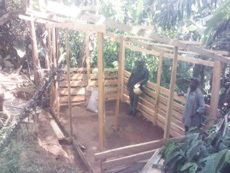 During this meeting a time frame was set during which work is expected to be completed for all the 10 pig pens in the two communities. 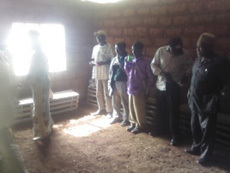 It was also agreed that government officials of the ministries of Livestock and agriculture be invited during the day of reception/inaugurating the piggery buildings. Meeting started with prayers, followed by a review of the meeting agenda and previous resolutions. Delegates Relax outside and get set for a family photo. (With Njuh Charles, afternoon on a motor bike). Rest after work supervision. 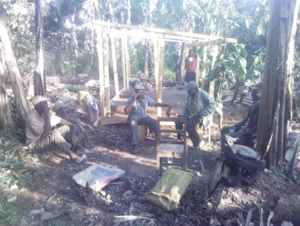 Seating in our natural environment is sometimes quite amazing and relaxing epecially when drinking our local palm wine. 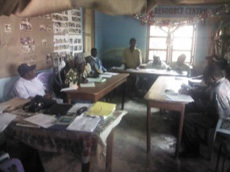 Last Evaluation meeting in Batibo,(Photos). 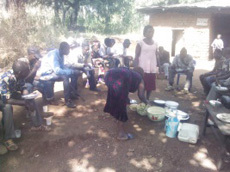 After visiting project sites, we settle down like a family for a drink and a common meal after prayers for our supporters at home and abroad. It is quite relaxing outside in nature under a tree than in a closed room taking advantage of the absence of rain during this dry season in a bright weather. Discussion are usally centered around the level of project realization and participation of members. What went wrong, with whom and how do we face our obstacles to make a way forword. 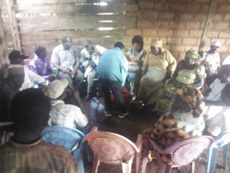 We also help resolve some group comflicts that are reported during our visits and encaurage a spirit of belonging and participation between members. This day, 28th December 2015 will be remembered for the alarm that was raised with the missing android of the project coordinator. 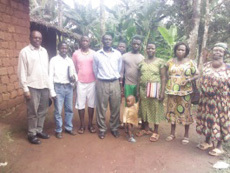 Almost the entire quarter of this village, Mbujei came out for a search along the highways. 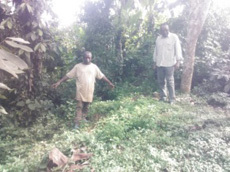 The Quarter head called on its inhabitants, saying anyone who has picked it and is not willing to return it will be cursed by God because the owner is out for development and not for evil. In addition a promise of a handsome reword to who so ever finds it was made to the people present. NB;- The 70.000Frs was not inclusive in the actual project budget but was used in the realization of the project as stated above because we saw the unavoidable need. 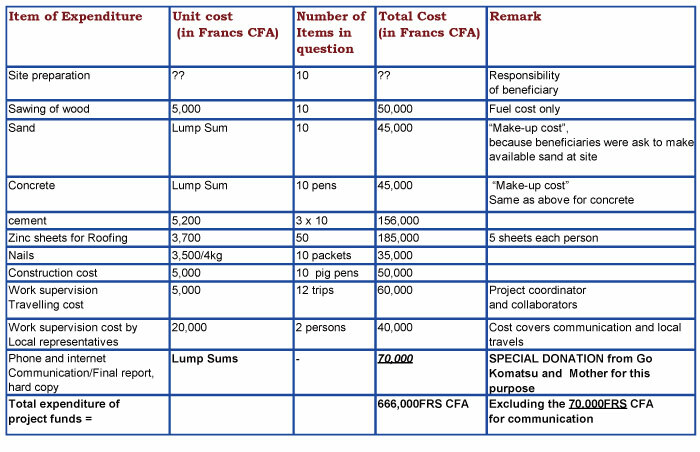 So Actual Expenditure is, 736.000 FRS CFA which therefore corresponds to the Actual income from partners. 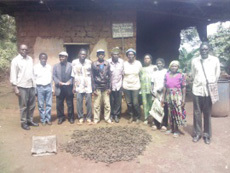 NB;- Some Cooperative members as well as the beneficiaries themselves put in enough human and financial contribution to make up for the success story which has not been mentions above and we wish to acknowledge and thank those who in any way have participated in this infrastructure project and hope that they will continue in the same spirit during subsequent projects. 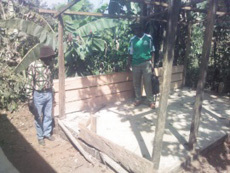 Seven (7) out of the ten (10) fences have been roofed but action on the rest 3 has been suspended because the group has failed to respect the agreed conditions for beneficiaries. It is hoped that they will comply within the first few days of 2016. These compliances could either be the none payment of cooperative membership annual dues OR the absence of a pig because you either lied that you had one or you sold it already and so need to replace it immediately as it was a pre-condition for benefiting. 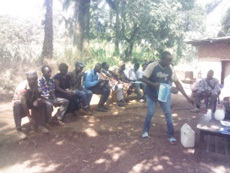 Difficulty in choosing who is eligible to benefit even though the guide lines for beneficiary was stated clearly at the start of the project during the sensitization meeting in Bamenda. Friction between group members after the choice of beneficiary has been made known was actually a cause for concern. 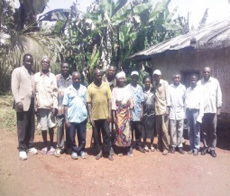 The situation was more serious with the Ngenmewah group where chronic leadership crisis was observed and members demanded that it should rather be a group pig pen than to be a pen for an individual within the group as it was the case with other groups. 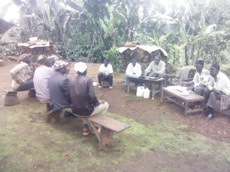 Lack of time consciousness during evaluation visits to beneficiary farmer groups. Members came to meetings very late and sometimes even absent. 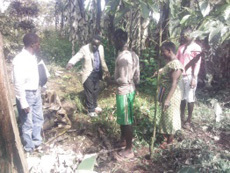 The engine saw operator was usually not available at the scheduled time and some beneficiaries had a long distance from the forest where the wood was sawn to piggery site and no provision was made for the motivate of saw operator. 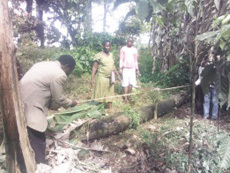 Beneficiaries with larger trees complained that the cost of sawing was more than the 5000frs CFA that the project funds provided. 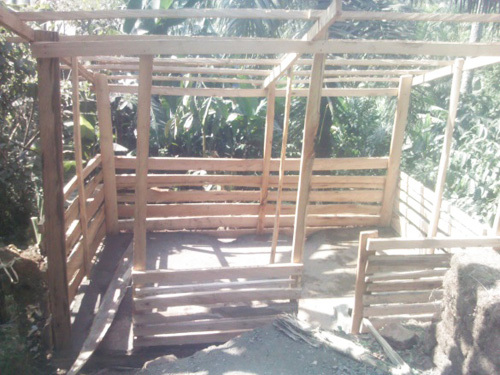 The construction cost of 5000 FRS each was far less than it was demanded by the builders, so that responsibility was shouldered by villager members with a lot of pleading and assisted sometimes by the project coordinator himself. 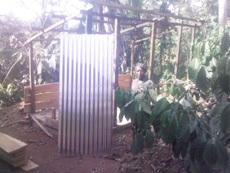 The 5 sheets of 2meters long zinc (roofing material) that was provided to each beneficiary were not enough to cover the whole top of the two rooms pig pens. 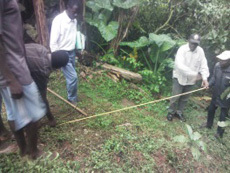 It was quite tedious for the local, village representatives to move from one beneficiary to the other during work supervision without a means of movement and more over the motivation given them was far less than the efforts they put in. 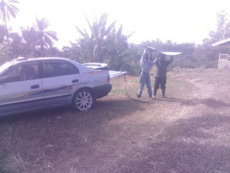 The project coordinator's android digital device used for making project photos which was bought from Japan 2014 (in HARD- OFF), dropped from the top of vehicle on the 28th December during Zinc distribution to beneficiaries. 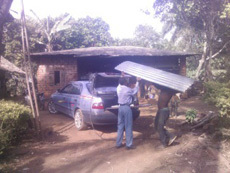 During the supply of zinc to second beneficiary the android was left on top of the vehicle and upon departure it was forgotten, so it fell off and during supply to the 3rd Beneficiary it was discovered missing. We went back immediately to search and make a public announcement/notification calling on anyone who finds it to bring it back to us against a 10.000frs CFA reward. A day after it was brought to us in Bamenda and we gave the person 10.000frs CFA (not budgeted) with a lot of appreciation. Internet connections sometimes fail to respond and so cause some delays in responding to mails from our supporters. Phone communication also has similar connection problems. The Use of public cybercafe to browse the internet out/far off home is an additional reason for delays and this is because using the MTN/Orange/Camtel internet keys on laptop at home is also costly with the various options offered by their ICT services. Photo quality is very poor with the android device of the project coordinator; a good digital Camera is needed for reporting as the first long serving Camera got damaged early 2015. 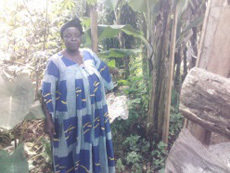 The absence of permanent paid staffs for the cooperative makes office work, bookkeeping, accounting, fieldwork follow-up etc quite difficult for the few volunteer staff who as family people, are often distracted to do other jobs that could earn them some money to run their homes. Because of their level of education, most beneficiaries gave verbal appreciation by saying;- "We thank the Japanese people and the people of the Netherlands for the wonderful gesture of support that they have given to us, we wish God's riches blessings to all our supporters come 2016. 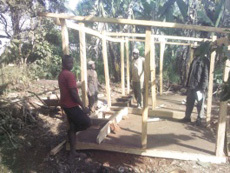 This support has helped to rekindle our love for the pig farming profession as we will enjoy our new farm infrastructure and hope to expand" . 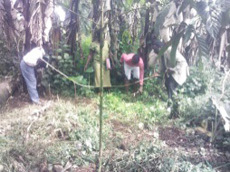 I observed a lot of happiness with the beneficiary farmers as they will not stop telling others. 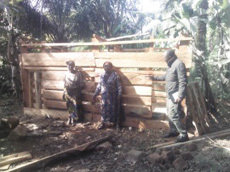 News of the infrastructure project spread to people in the neighboring villages and sub-divisions/Division within the North West Region as wild fire and thereby raising awareness to people who did not know the pig cooperative. 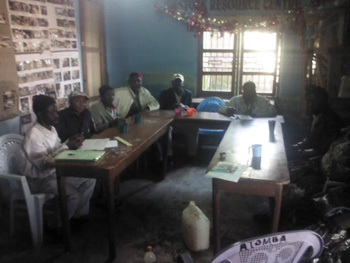 It is quite hopeful that the cooperative membership will increase by 2016 therefore expectation for similar support by pig farmers will be quite high in the year 2016. 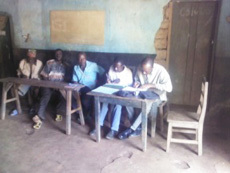 If given a means of movement and a small running allowance, our local enthusiastic field supervisors, as they have proven to be, who are currently assisting the general coordinator with the mobilization of farmers and work on the field, could do even more better to support the growth and sustainability of the pig cooperative in all dimensions. 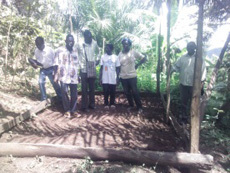 We recommend that more training be organized in different places if we have the means and also that besides improving the infrastructure of more farmers, we could also continue with the POG project of Djouke Elferink because it contributes a lot in building a strong bond, harmony and social ties between members of the cooperative and also influences the coming in of new members. 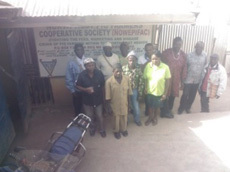 A support project that could employ at least 4 permanent paid staffs for the cooperative for a period of at least 2 years will help the cooperative to generate activities that can sustainably handle the salaries of the 4 staff after the end of the 2 years. 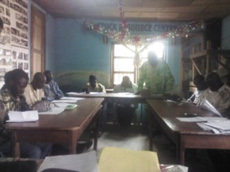 With several trainings envisage for different communities this year 2016 and subsequently, the Cooperative greatly needs an overhead projector which could make the training quite interesting and animating. 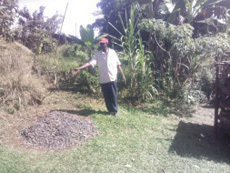 Beneficiaries of this project have been informed that they have the responsibility of ensuring a sustainable use of their new infrastructures making sure that at no time should pigs be absent from these piggeries but rather use the example of the current structures to expand their farms and increase pig production to quantities that can justify the current action. We have the strengths and the opportunities but we need the means to face and tackle our threats and weaknesses.